Convert FAT Volume to an NTFS File System. Sometimes, you probably need to convert your FAT volume like flash drive or external hard drive to an NTFS file system. But you're confused, if you do this then all of your existing data will be deleted. It doesn't need to be happened, with a few easy steps you can convert your FAT volume to an NTFS file system safely and your existing data would not be deleted. Although this process is safe, you still have to be careful that an error could still have occured, it is strongly recommended to you to backup your existing data on the drive that would be converted to another drive. So far, i never have any problems with it and the process always run properly. How to Convert FAT Volume to an NTFS File System Without Formatting or Losing Data. Press Windows button + R , after Run dialogue appears then type "cmd" (without quotes) and hit Enter. 2. Run command in the Command Prompt. 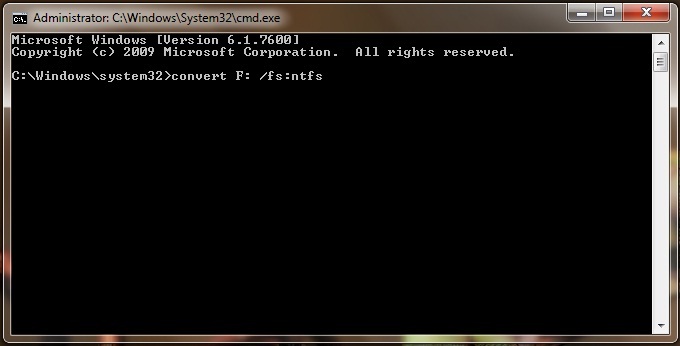 After Command Prompt window appears, type "convert your_drive /fs:ntfs" (without quotes) and hit Enter. Change the word "your_drive" to your volume that need to convert, for example i use the "F" drive in this project. And then, you will be prompted to enter a volume label for your drive, just type a name like DATA (or whatever that you want) and hit Enter. Wait a while, untill the process is complete and the Command Prompt show a notification that the process has been running successfully. The length of process depends on your drive volume. To check if the drive has been converted, right click on the drive and select properties from the pop-up menu. See in the Disk Properties window at General tab, it should be shown the file system as NTFS.